Volkswagen’s top brass will be up for the chop in 2016. 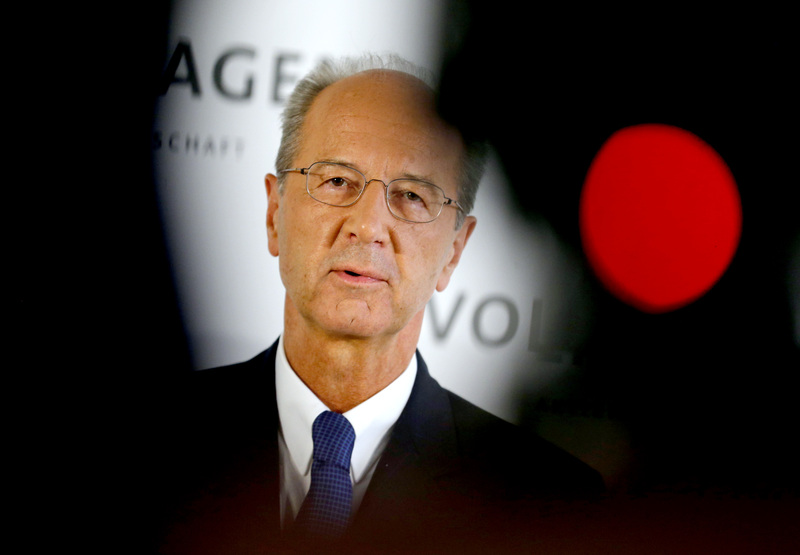 The German carmaker’s chairman and chief executive are both new to their roles. But in the coming months the company faces both multibillion-euro fines as a result of cheating on its diesel emissions as well as a scathing external report on its governance. These will shine a spotlight on leaving long-term insiders in charge. Matthias Mueller, who took over as CEO after the emissions scandal cost Martin Winterkorn his seat at the wheel, is a VW lifer and former Porsche boss. Hans Dieter Poetsch, meanwhile, spent 12 years as finance chief before becoming chairman. There’s some justification for appointing one of them: steering the overly complex vehicle that is Volkswagen through an existential crisis arguably requires detailed knowledge of its inner workings. Installing both of them, though, seems tin-eared. Of the two, Poetsch looks the more exposed. First, he’s a confidant of Ferdinand Piech, the towering patriarch of the Porsche family, VW’s controlling shareholder. Piech spent 22 years as boss and then as chairman of Volkswagen until being forced out in a power struggle in April 2015. He started the empire-building and created the internal fiefdoms and sclerotic culture that worsened under Winterkorn. Poetsch is also, thanks to having held a seat on the executive board as finance director, one of those who can be held legally responsible for any company misconduct in the emissions scandal. And he is central to a key legal issue: whether the 17-day delay in September in informing investors about its emission woes after admitting cheating to U.S. regulators can be justified. All this puts Poetsch in a difficult position to start with for many of the tasks he will have to carry out as chairman. These include assuaging the anger of American regulators, lawmakers and VW shareholders. His role is likely to get even trickier as scandal-related costs mount: the 8.7 billion euros the company has so far set aside do not cover any fines; and the U.S. Environmental Protection Agency alone could impose a penalty of up to $18 billion. Meanwhile, U.S. law firm Jones Day’s investigation into the inner workings of the scandal will probably unmask the carmaker’s rotten internal culture as well as whatever role Poetsch played. Appointing an independent chairman in 2015 would have been a smart move. In 2016 it will become a necessity. German carmaker Volkswagen replaced both its chairman and its chief executive in 2015. Ferdinand Piech stepped down as chairman in April after losing a boardroom battle and was replaced in October by former Chief Financial Officer Hans Dieter Poetsch. The group’s long-term Chief Executive Martin Winterkorn resigned in September after it admitted it had manipulated the emissions of 11 million diesel cars. He was succeeded by Porsche Chief Executive Matthias Mueller. Volkswagen commissioned U.S. law firm Jones Day to undertake an independent investigation into the emissions-cheating scandal. The firm’s findings are due to be published in 2016.